WTOP Garden Editor Mike McGrath has tips to keep deer and other pests, including insects and crab grass, out of your yard this year. Meet Mike on April 16 and 17 at The Calvert (County) Home Show in Prince Fredrick, Maryland. Find complete details at midatlanticexpos.com. Is a greenhouse the answer to animal and insect problems? Unfortunately, yes, Bonnie. Greenhouses are great for getting an early start on the season (you could, for instance, be harvesting spinach in a good greenhouse right now). But good ones are expensive, and all greenhouses get too hot to use over the summer. They’re more for starting early in the spring, extending the harvest in the fall and (in attached or heated ones) growing cool-season crops over the winter. And insect pests are often a bigger problem inside them than outdoors. One of the best ‘deer devices’ is back! A great way to deter deer is available again, directly from the designer after a long absence. The Wireless Deer Fence system is a set of green plastic stakes sold in packs of three for around $60, with metal tops that hold a deer-attracting scent pellet inside four electrodes. You place the pellet inside the electrodes, insert a pair of AA batteries into the belly of the device and place it in areas that deer frequently browse. Attracted by the scent, the deer will lick the electrode and get a startling — but harmless — shock. 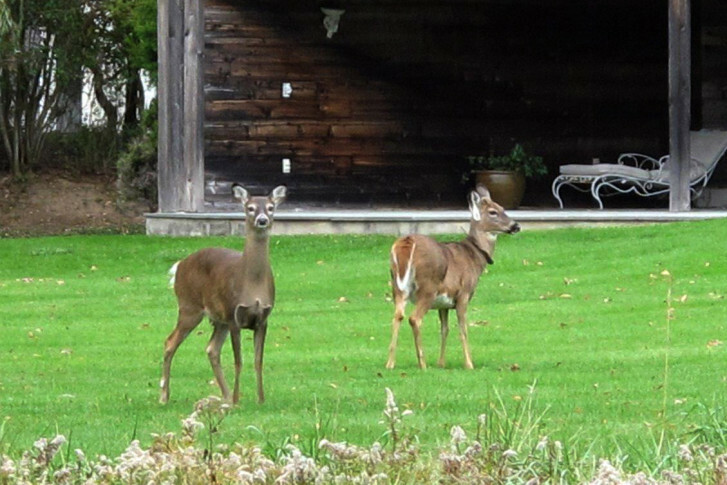 And once shocked, they don’t return — they go and eat the neighbor’s hostas. I depended on these things for years, but they slowly fell apart: some because I foolishly left them out during winter ice storms; others were damaged by deer kicking them as they ran away from the shock. New ones became hard to find and I feared they had become extinct. These new versions look pretty much like the old ones, but have some significant improvements: a better water seal (two ‘O’ rings instead of one) in the battery area and improvements in the scent pellets and electrodes. I can’t wait to put mine out this weekend! In my garden, they are tied for first place for deer control effectiveness with my motion-activated sprinklers. And these zappers can be used to protect plants in the dead of winter, when you can’t use a sprinkler. I know I’m gushing, but this discovery really made my day. Deer are a huge problem for gardeners, and these stakes are a great alternative to actual fencing. And unlike spray-on repellents, they only need to be purchased once. Welcome back guys; I missed you! Now — what about all those bugs? Pest insects are best prevented by growing healthy plants in sunny, raised beds that are no wider than 4 feet (so you never step on the soil in the beds). Use compost and/or organic, naturally-based plant foods instead of chemical fertilizer. Pests are attracted to plants that suffer from lack of sun, overcrowding, poor drainage, overwatering and especially use of chemical fertilizers. “Accelerating,” John? How about advancing faster than a speeding bullet? Soil temps typically move independently of the air temperature — and much more slowly. But typical seems to have been tossed out the window when it comes to the weather these days. In the past week, some soils in our region have zoomed up an astounding 10 degrees (as measured 4 inches down!). And right before this weekend’s little cold snap, some soils were hovering close to the 55-degree temp at which crab grass seed begins to germinate. So spread your corn gluten meal ASAP. Ideally get it down, wet it well and then let it dry out for a while. Unfortunately, the deal is that many state extension systems are still stuck back in the late 19th century, when they were supported by pesticide and fertilizer companies, who of course encouraged them to recommend their kinds of products. However, your local state extension office is an excellent source of information about the best plants for your region, landscape and conditions. In that arena, their advice is likely to be much better than mine. They are also a very good source for identifying specific insects and weeds. And in some cases, they will recommend the same nontoxic products as I would for some of those pest problems — such as Bt for control of caterpillar pests. But many still have a penchant for chemical solutions. Oh, and your corn gluten meal is a pre-emergent herbicide; it’s just a naturally-derived one instead of the chemical versions (which are in the process of being outlawed in Maryland’s own Montgomery County over the next few years). These new lawn care laws — designed to protect the Chesapeake Bay from fertilizer runoff — limit it to about half that amount because of its natural nitrogen content. But you know what? I bet you’ll be very happy with the results if you spread the legal amount of your corn gluten ASAP, water it in and let it dry. Then cut your turf to 3 inches high (never lower!) with a newly sharpened blade. Leave the pulverized clippings behind. And only water deeply and infrequently — and only when you don’t get an inch of rain that week. The biggest enemy of crab grass is a well cared-for lawn, and corn gluten meal provides the perfect amount of natural nitrogen to get yours off to a great start … should kill a few crab grass seeds as well.